This post almost didn’t happen. This post was almost a picture of a salad from Panera or burger from Five Guys. I’d begun gathering what I needed for dinner, my mise en place, if you will. It wouldn’t take more than 15 minutes to prepare. But 15 minutes was apparently way too long for my littlest guy. As I moved about the kitchen, he was on my heels, quick as a cheetah and loud as lion. Hold my hand. I’m ready to snuggle up. He roared. He screeched. He howled. And I surrendered to my little master. The kids’ dinner became a quick PB&J and microwaveable mac and cheese. The screaming stopped. I packed away the ingredients for tonight’s intended dinner. I’m not proud. But hey, I never claimed to be supermom. Once everyone had their fill of snuggle and food, I had the chance to prepare the dinner I’d planned; breaded chicken with a spicy peanut sauce. Honestly, this is all about the peanut sauce. The chicken is merely a vehicle to transport the sauce to my belly. It’s sweet, it’s spicy, it’s salty. This sauce is also magic with skewered, grilled chicken and shrimp. Place the peanut butter in a microwaveable bowl. Microwave for a few seconds to soften the peanut butter. Add other ingredients and stir to combine. Add small amounts of warm water and stir until the sauce reaches your desired consistency. Taste and add more cayenne, if desired. Top with the chopped peanuts and/or scallions. Delicious served with chicken or shrimp! 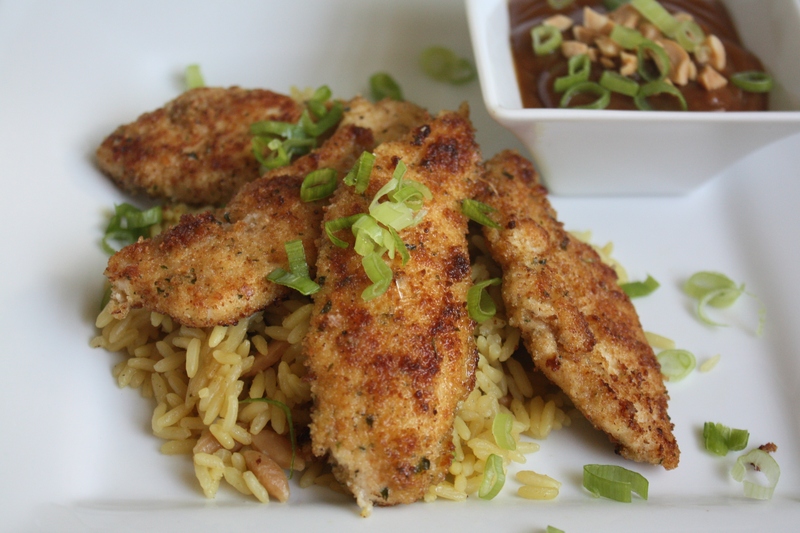 Season chicken tenders or chicken breasts cut into strips with a sprinkle of salt and pepper. In a small bowl, beat a couple eggs. Dip the chicken in the eggs. Then roll the chicken in seasoned bread crumbs until well-coated. In a pan, heat a couple tablespoons of olive oil over medium heat. Add the chicken and cook for a few minutes on each side until lightly browned and cooked through. Posted in Food, Main Course, Poultry, Recipes, Sauces and tagged Cooking, cooking with kids, Food, food photography, kids, life, Recipes. Bookmark the permalink. Yum. That looks soooo good. What a great quick meal for the week. 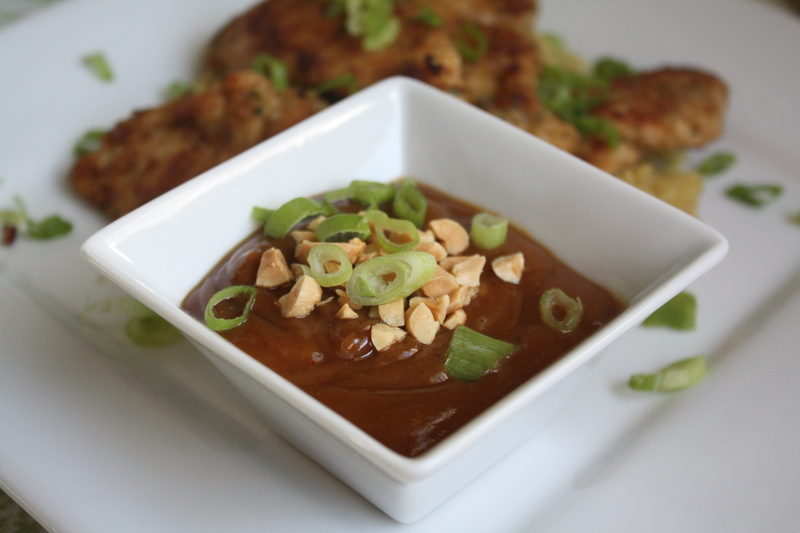 I looove peanut sauce! Made it last night. My daughter loves the chicken. Paired the dish with steamed broccoli and brown rice. My type of meal: quick, easy and delicious! Thank you for this… Made it tonight and it was a huge hit…. eveyone enjoyed it!!! will repeat for sure!